KANSAS CITY, Mo. — Kansas City International Airport was ranked second to last in its group in J.D. 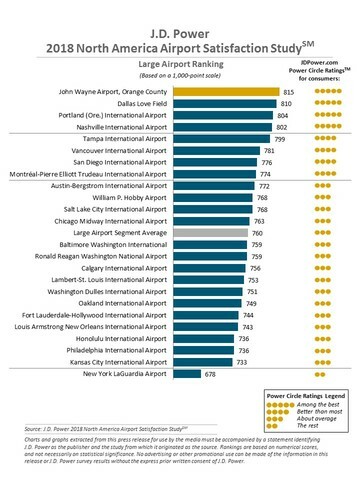 Power’s 2018 North America Airport Satisfaction Study. According to J.D. Power, the study measures overall traveler satisfaction with mega, large and medium North America airports by examining six factors (in order of importance): terminal facilities; airport accessibility; security check; baggage claim; check-in/baggage check; and food, beverage and retail. KCI was in the large airport group. Based on a 1,000-point scale, KCI fell second to last in the group with 733 points. The only airport with fewer points was New York's LaGuardia Airport with 678 points. John Wayne Airport, Orange County took the top spot in the large airport group with 815 points followed by Dallas Love Field and Portland (Ore.) International Airport.